For fourteen years, Letty Espinosa has worked three jobs around San Francisco to make ends meet while her mother raised her children—Alex, now fifteen, and Luna, six—in their tiny apartment on a forgotten spit of wetlands near the bay. But now Letty's parents are returning to Mexico, and Letty must step up and become a mother for the first time in her life. Letty Espinosa is a single mother with two children and she's never had the responsibility of raising her children, until now. Her parents have always been there and willing to pick up the slack while Letty worked to support the family, but her parents have returned to Mexico. We Never Asked for Wings by Vanessa Diffenbaugh explores the relationship between Letty and her children as they discover how to become a family and Letty discovers what it means to be a mother. Letty had her oldest child, fifteen-year-old Alex when she was a teenager. She thought she was in love but didn't want to burden her boyfriend at the time, Wes, with the responsibility of being a parent. She knew that Wes was meant for more. Her daughter Luna is six-years-old and has always depended on her grandparents and her older brother Alex for guidance. Sadly, Letty doesn't have the first clue about parenting as evidenced by the fact that she leaves her children at home without any money while she takes her mother to Mexico. Upon her return to the US, Letty realizes that she has to step up to the plate and become the responsible adult. No more alcoholic binges, no more late night parties, and no more working nights and sleeping the day away. She finds a job bartending at the airport during the day and is finally there for her children. She lies about her address to get her gifted son into an exclusive school. Life isn't going great, but it is becoming more manageable until Alex discovers who his father is and his father confronts Letty about having a teenage son he never knew about. If having Wes back in the picture wasn't enough to deal with, Letty is romantically attracted to a coworker and her son Alex is in a relationship that is getting too serious in Letty's mind. We Never Asked for Wings provides a fascinating glimpse into the lives and loves of the Espinosa family. We witness an inept mother striving to be and do better at parenting. We see the angst and drama of teens in love and making bad decisions. We watch as this family and their friends suffer the consequences of poor decision-making. But most important of all, we watch this mother and two children become a family. To say that Ms. Diffenbaugh has a way with words is a massive understatement. Her writing immerses the reader into the lives of these characters and it was hard, at least for me, not to rejoice with their small victories and suffer through their pains and disappointments. We Never Asked for Wings presents well-developed characters with realistic action and settings. 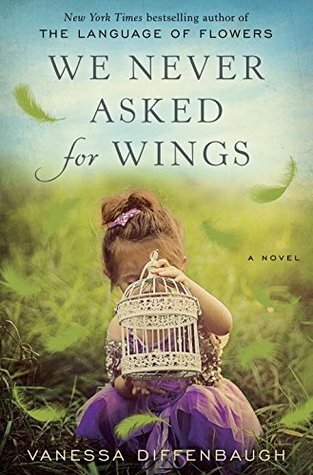 If you're looking for a story about love, life, and family, then look no more, We Never Asked for Wings is the book to read. I enjoyed this book as much as I enjoyed The Language of Flowers and I look forward to reading more from Ms. Diffenbaugh in the future.